According to Jane's IHS, France is currently considering to increase the amount of tanks to be modernized and kept in French Army service by 25, increasing the total amount to 225 Leclerc main battle tanks (MBTs). The original contract for the SCORPION program was announced by the French state-owned company Nexter (formerly known as GIAT) on March 12 in 2015. Back then the modernization of 200 tanks and 18 Leclerc DCL armored recovery vehicles was ordered for a total of approximately €330 million (or about €1.51 million per vehicle). Nexter originally developed and produced the Leclerc tank for the French Army aswell as the export version with German MTU powerpack for the United Arab Emirates' Army. The upgraded Leclerc will have the "Standard F1". Originally the Scorpion program/Leclerc Standard F1 was announced in 2013, when a delivery in 2018 was expected. In it's press release, Nexter however mentions the delivery will happen beginning in 2020. Nexter claims that the Scorpion program "aims to maintain this capacity beyond 2040", which seems to be a very optimistic estimation of the Leclerc's service life, given that France is known to be developing the new MGCS tank together with Germany, which is expected to enter service in 2030 to 2035. The Scorpion program adds a new radio system (called CONTACT according to Nexter), the SCORPION battlefield management and command system and upgraded protection by use of interfaces, allowing the Leclerc to adopt different armor packages for protection against new threats, such as improvised explosive devices (IEDs). This CAD model was shown when the Scorpion program was announced in 2013. 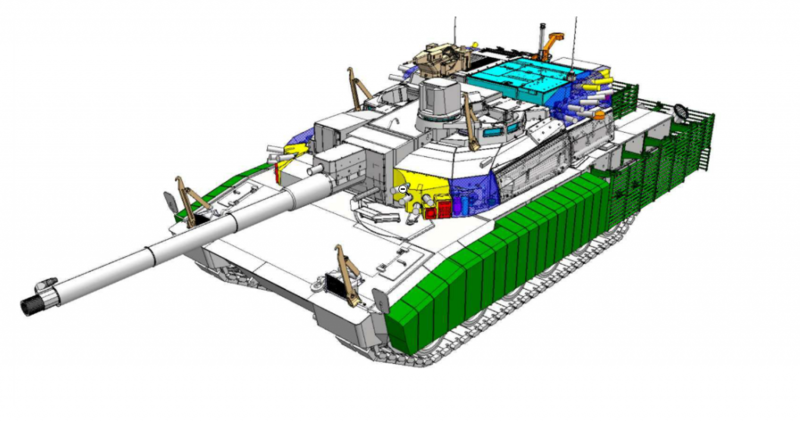 The new armor (green) covers the side and rear section of the tank's hull only. It appears to be similar or even identical to the Leclerc AZUR (Action en Zone Urbaine) that has been revealed in 2006. The frontal two thirds of the new armor seem to panels made of what seems to be reactive armor (either NERA or ERA) - this covers the whole crew compartment. The rear section of the hull and the turret is only protected by slat armor. Four wire cutters and a new RWS (light brown) are added to the tank, two of the mounted on the turret roof and two on the hull section. Furthermore the number of the GALIX smoke grenade dischargers (yellow) has been increased dramatically - from 12 to 24. Two banks of 4 smoke grenade dischargers are mounted on the turret front, while the original GALIX launchers are increased in size (from 6 to 10 smoke grenade each). Laser warner sensors (red) also have been fitted to the tank, which could in theory work together with the GALIX system like a full softkill active protection system. The Leclerc Standard F1 is also fitted with a close proximity surveillance system (orange), consisting of three camera/sensor systems mounted at the turret sides and rear. In the end one has to wonder about the Leclerc upgrade and the decisions of the French government. While Germany and the United Kingdom have announced future upgrades to their respective main battle tanks directly related to the appearance of the T-14 Armata MBT and the worsened relation between NATO and Russia, the French Army seems to upgrade their tanks for the wars of the past. Don't get me wrong, we will probably see a lot of assymetrical warfare and urban combat in the future, but that's not necessarily where the main focus of the tank upgrades should be put on in the future. The turret of the scale model showing the Leclerc version suggested for Turkey. Can the Leclerc's frontal armor survive being hit with a new 125 mm APFSDS from the high pressure 2A82-M1 tank gun of the Aramata or the 125 mm 2A83 gun, which might be used on the (final) production version of the Armata? While only being a prototype back then, the Leclerc was considered the weakest armored tank in the Swedish trials of 1993. Sure, the current Leclerc from the late production batches are quite a lot heavier (~3 tons) than the earlier prototypes/LRIP versions, but the old Leclerc in Sweden was fitted with additional armor modules developed by IBD and Åkers Krutbruk... so there is some reason to doubt that. Then there are also issues with the main gun. Germany has announced to develop improved performance 120 mm guns/ammuniton for the Leopard 2 and a 130 mm as mid/long-term upgrade plan. How well does the slightly shorter L/52 gun of the Leclerc perform against a T-14 tank using slightly shorter/older ammunition? It seems that there is also not much reason to assume that the Leclerc is fit to beat a T-14 tank in this specific aspect. The Leclerc needs further upgrades in the future to stay relevant until 2030/2040. 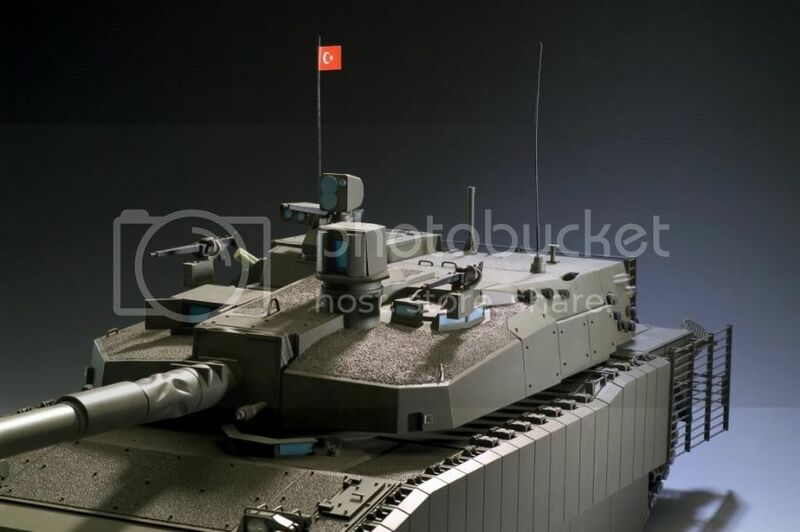 The Leclerc version pitched to Turkey - during the time when the Turkish Army was looking for a new tank to be produced in Turkey during 2005-2007 (in the end the K2 was chosen to become the base for the Altay tank) - seems to be very similar to the actual Leclerc Scorpion upgrade, despite the difference of about 10 years. The armor configuration of the Leclerc Standard F1 is already used on the UAE tanks in combat. On the French scale model, the GALIX system also received additional launcher (but lacked the additional two banks at the turret front). The armor was upgraded in a similar manner, laser warners and an actual softkill active protection system (with a IR/UV jammer on top of the turret) were also added. This is where I would say, that France slept a bit when it comes to keeping the Leclerc upgraded to the latest configurations. To Syria: https://www.youtube.com/watch?v=SKOjis5Gw20 we are seeing a huge growth in the use of armour in urban terrain and in ATGMs to counter them. Even the heaviest of MBTs - the Leopard 2's modernisations - now have an ADS of some kind, for their tech demonstrators if not yet formally adopted. The T-14 Armata's Afghanit is probably the most advanced at the moment simply because of a focus on active systems in the East as opposed to passive systems in the West. Any tank that does not carry one in the decades going forward will be increasingly threatened as the ordinary footsoldier (or guerilla) gains capabilities to foil the most powerful land combat asset. On the armament side, it is a little strange that a modernisation that is supposedly geared toward urban combat is so lacking in such. There's no bulldozer blade to clear rubble or clear roadblocks. The remote weapons system is 7.62mm as opposed to an automatic grenade launcher - one of the most valuable tools in urban combat for suppression and elimination of threats. Alternatively, Nexter would do well to hark back to the days of the AMX 30B2 and replace the commander's MG with a 20mm autocannon in a high elevation mount. This would not only allow for the improvement of urban warfare capability, but also in open combat, an autocannon is much more likely to suppress enemy ATGM teams than main gun rounds. I agree with you that France has been caught napping. But this is the logical result of a peace dividend and few land-based threats. Expect France to engage in expeditionary warfare only in, say, the sub-Sahara, where the threats to armour are lower. But even here, it is likely that French influence on the African continent will be superseded by massive Chinese investment, infrastructure, and foreign military sales. The land warfare component for France will be hard pressed to justify its existence.